[toc]Bed Sores are basically ulcers or sores which usually develop when the person in bed or wheelchair ridden for a long duration of time. Bed sores are also commonly known as pressure sores, as these sores develop due to pressure exerted by the bone on the skin and tissues of the body. The Bed sores are commonly seen on back, hips, lower base of spinal cord, elbows, ankles, heels etc. Bed sores are usually very painful and a source of great discomfort for the patient. Bed sores can be easily treated and cured when detected early on. If left untreated for long, they may develop into deep seated ulcers, which may even become life threatening. Bed sores are often treated with proper dosage of antibiotics, keeping the sore clean and dry and maintaining a nutritive diet regime. It is also necessary to keep shifting the position of the bed ridden person to take the pressure off one particular region of the body, thereby preventing the occurrence of bed sores. 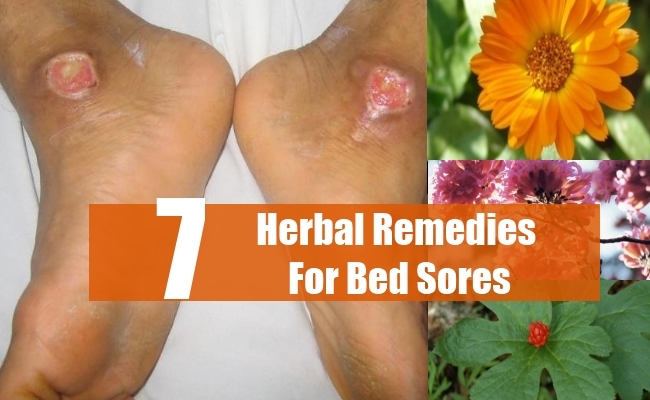 Below mentioned are simple herbal remedies which help in treating bed sores without any side effects. Calendula is the most widely used and popular herbal remedy for treating Bed Sores. Calendula cream is very effective in providing a soothing and cooling effect on the irritated skin around the bed sores. Calendula is rich in antiseptic properties, which help in killing the infection. Calendula is rich in flavinods, which are very effective in reducing the inflammation of the skin caused due to bed sores and boosts the overall immunity of the body. Calendula has also been used very popularly to cure various other skin problems like-redness, puffiness, irritation, itching etc. It is also very effective in treating other skin infections, cuts, wounds, sunburns etc. 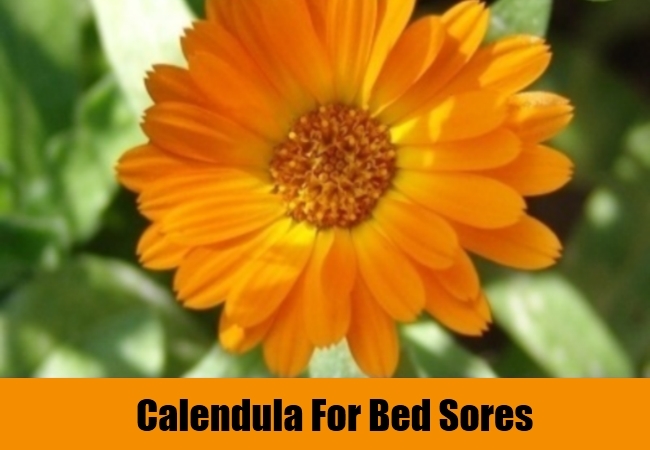 Calendula can be easily applied on the bed sores in form of cream, ointment, lotion etc. 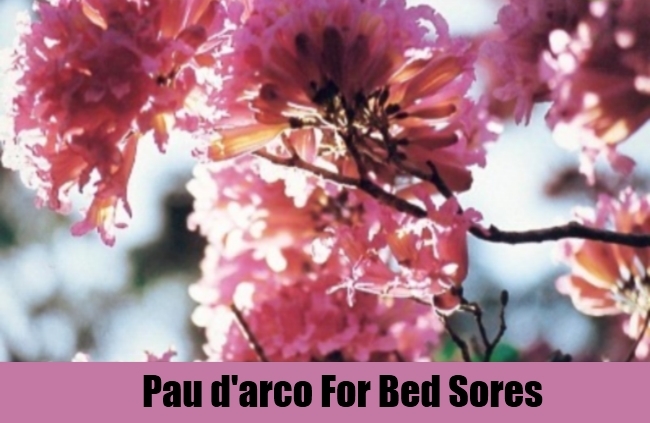 Pau d’arco has been used traditionally to treat the problem of bed sores. Pau d’arco not only helps in fighting against the bacterial and fungal infections but also encourages the healing process of the bed sores. This herb is also very effective in reducing the inflammation and redness of the skin caused by bed sores. Pau d’arco can be applied externally in form of creams, gel, ointments etc. Alternatively, it can also be consumed internally in form of herbal tea, capsules, tonics, tincture etc. Goldenseal has been used since centuries to treat various skin related problems, including Bed Sores. Goldenseal is rich in chemicals known as berberine and hydrastine, which help in fighting against the various bacterial, microbial, viral and fungal infections. It helps in reducing the inflammation of the skin membranes and provides a soothing and calming effect. 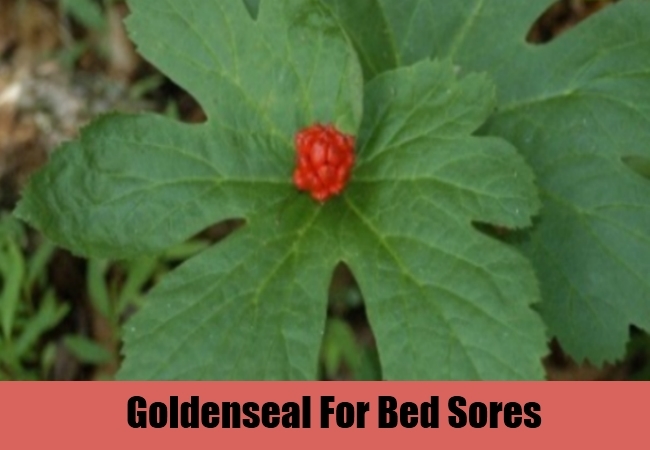 Goldenseal can be used both externally as well as internally to cure bed sores. A herbal tea made using Goldenseal in very beneficial in quickly drying up the bed sores. It can also be applied tropically to to the bed sores in form of ointment, cream etc. Aloe Vera is another very beneficial herb which has been used extensively for treating Bed Sores.Aloe Vera helps in providing a soothing and calming effect to the irritated skin membranes due to inflammation caused by the bed sores. It provides relief against severe itching and reduces the redness of the skin. 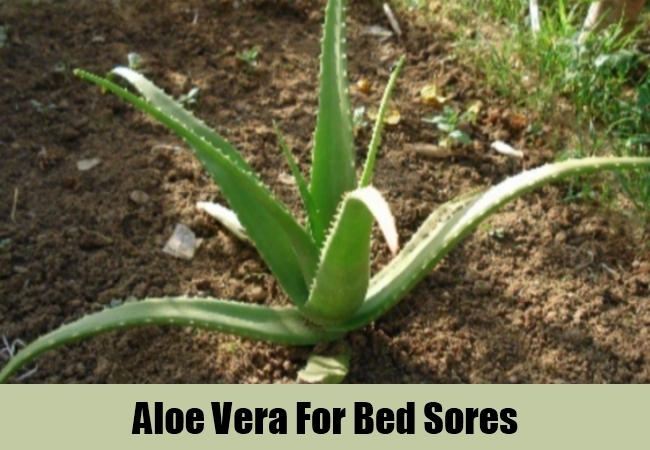 Aloe Vera also helps in bringing down the swelling and puffiness in the skin accompanied by formation of bed sores. Aloe Vera is a rich source of Vitamin E, and helps in regenerating the skin destroyed by bed sores, thus bringing about healing. Aloe Vera also helps in removing the toxins and purifying the blood, thus reducing the instances of bed sores. Aloe Vera juice can be consumed internally for blood purification and reducing inflammation. It can also be applied externally on the bed sores in form of gel, fresh extract, ointment, cream etc. Myrrh has been used traditionally as a very popular herbal remedy to heal Bed Sores. 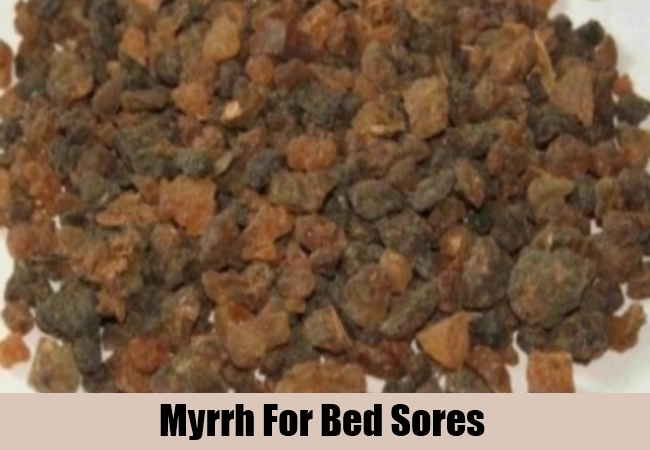 Myrrh helps in reducing the inflammation caused due to bed sores and brings about healing. It is also very effective in cleaning and purifying the blood by removing toxins from the body, thereby reducing the re-occurrence of bed sores. Myrrh also helps in increasing the flow of blood in the body, which is very beneficial in curing of bed sores. Myrrh is also a very good naturally found antiseptic and helps in fighting against various bacterial, fungal and viral infections. Myrrh can be consumed internally in form of herbal tea, or applied externally to the bed sores in form of salves, ointments, creams, gels etc. Comfrey is yet another very beneficial herbal remedy used for almost all types of skin infection, wounds, cuts, bruises, bed sores etc. The root and leaves of Comfrey are rich in medicinal properties and are used for promoting healing of the bed sores. Comfrey is especially very effective in eliminating the inflammation and severe pain associated with bed sores. Comfrey is rich in tannins, which help in stimulating the process of healing by forming a protective covering over bed sores. 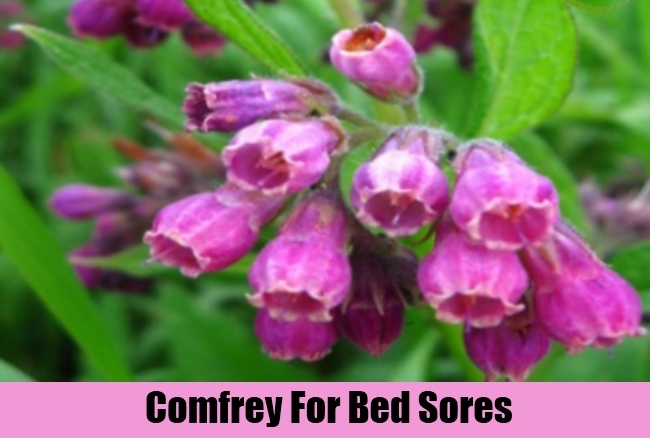 Another very important component of Comfrey is allantoin, which helps in regeneration of the cell tissues both internally and externally, thereby speeding up the process of healing of bed sores. Comfrey can be consumed internally in form of herbal tea, decoctation, tonics etc. It can also be applied on the bed sores externally in form of poultice, compress, creams, ointments etc. 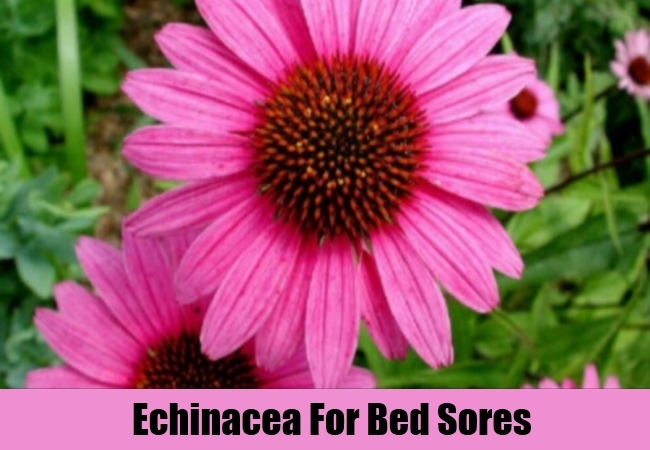 Echinacea has been used effectively as an herbal remedy to treat Bed Sores. Echinacea is renowned for its anti-viral and anti-fungal properties, which help in fighting against the infections causing bed sores. It also helps in reducing the inflammation caused by the bed sores and provides a cooling and soothing effect on the bed sores. Echinacea also helps in elevating the itching and pain associated with Bed sores and promotes healing. Echinacea is especially very effective when used in combination with other antiseptic herbs like Goldenseal etc. The root of Echinacea is rich in medicinal properties and can be consumed in form of herbal tea, tincture, tonic, capsules etc., to air healing of bed sores. Alternatively, Echinacea can also be applied externally to the bed sores in form of compress, skin was, salve, ointments etc.